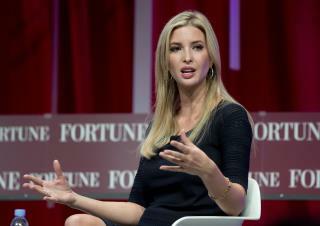 (Newser) – Possible future First Daughter Ivanka Trump is in legal hot water. Aquazzura, a luxury Italian shoe company, says one of Trump's shoe designs for her fashion collection is a copycat of one of its own popular sandals. The company is suing Trump and three companies that work with her, and wants a court to stop her from selling her version of the shoe, USA Today reports. The issue is over Aquazzura's Wild Thing sandals, which have an insanely high heel and lots of fringe and cost $785, and Trump's Hettie High Heel sandals, which have an insanely high heel and lots of fringe and reportedly cost $145 before they became unavailable on Bloomingdale's website. Yahoo Style has a side-by-side comparison photo. Aquazzura had actually called Trump out way back in March, posting a photo of the two shoes on Instagram and bemoaning that moment "when someone blatantly steals your copyright designs and doesn't care." deep pockets attracts all types of reprobates.